It seems like ages since I posted a review for a game I like, so I thought I would write something about this new little card game from Martin Wallace. Now, before I begin, I should mention that I don't often pick up card games: I'd rather be pushing lumps of plastic around maps of dungeons than trick-taking. However, I have recently found myself in the situation where I have more games than shelf in my study; and this Christmas I also imposed on my wife a spending cap for gifts, which would have been blown right out of the water by a single Fantasy Flight Games product. As a result, I ended up asking for The Hobbit Card Game and the new edition of Dungeon!, both of which come in small boxes, and are about as cheap as games get (while still looking amazing). My wife is a bit of a star, and purchased both games for me; and on Boxing Day I had the chance to play my first games while the parents were visiting. Now, don't get me wrong, I do have quite a few light, "filler" card games in my collection; they just aren't my first choice unless I am in a situation where I am playing with a lot of "non-gamers" or I don't have a lot of spare time to play. 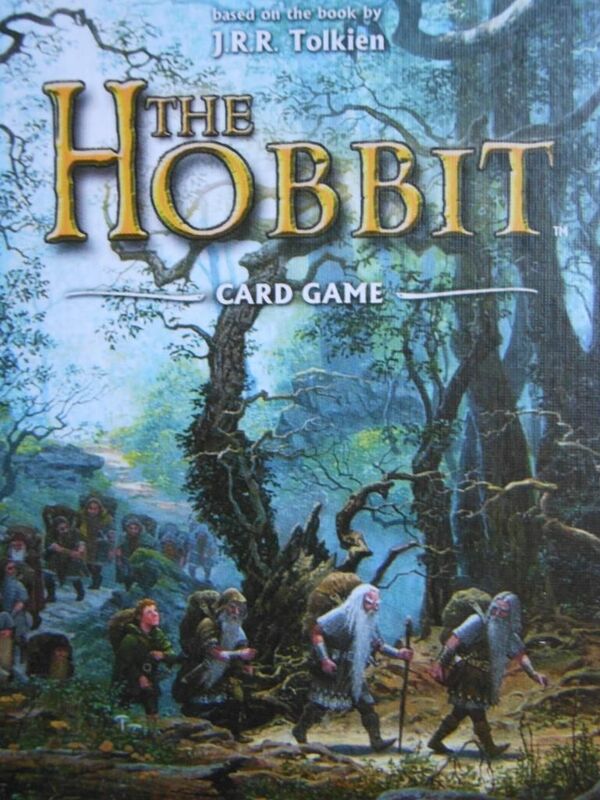 So, even though The Hobbit Card Game might not have been my most anticipated release of 2012, I had already noted its arrival in stores and had checked out the rules online. The game is basically trick-taking, but it had a twist that interested me greatly. 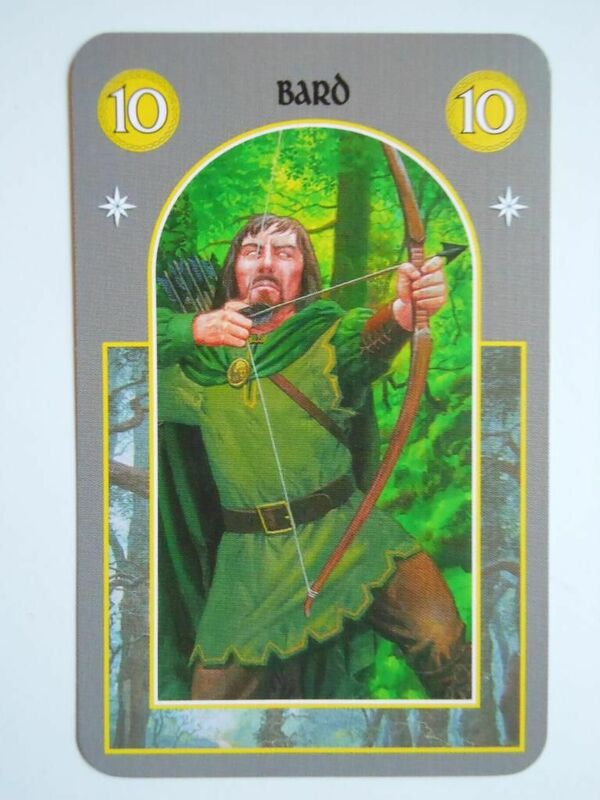 The fact the game is based on one of my favourite childhood stories, and features the artwork of Ted Nasmith (who is probably rivalled only by John Howe when it comes to illustrating the world of Tolkien), was the icing on the cake. I normally start my reviews with a rundown of components, but in this case that won't take very long. For your money (which, in the UK, is less than £7 delivered to your door!) you get a sturdy little box with a beautiful cover illustration, inside which you will find a single piece of folded paper containing the instructions and a single deck of cards. There are 65 cards in total: five showing characters from the story, and 60 showing various images with a numerical value and a suit colour. The cards... The fronts are much more interesting. The artwork on the cards is really nice (although not necessarily the best work I have seen from Nasmith), but the appearance is slightly harmed by the overall card layouts, which are rather bland and feature a sold grey background. Overall, the design is perfectly functional, and you can't really complain too much because the artwork is so good. Also, the cards are pretty sturdy and should survive quite a lot of shuffling (I hate sleeving cards, and normally don't bother). The game is incredibly simple, but before I talk about that, I do just want to mention the theme, which I am sure is going to attract a lot of people. The cover of the box states, "based on the book by J R R Tolkien." This isn't really true. Sure, there are characters from the book on certain cards, but this is a trick-taking game that features some nice fantasy artwork. There is no story, no sense of progression through Bilbo's adventure to Smaug's lair. Don't expect high adventure in a world of magic. Expect trick-taking with pretty artwork. Okay, enough already. How do you play the game? Well, that really depends on how many players you have, because the rules for a two-player game are slightly different. I haven't played any two-player games, so I will just talk about playing with three or more. Each player gets allocated a character from the book. There are three good characters, and two evil characters. Good players work as a team, and will win as a team, and the same applies to the evil players. In a three-player game, the good team comprises Thorin and Bilbo, and one player gets to be Smaug; in a four-player game, the good team adds Gandalf; and in a five-player game, Bolg the goblin king is added to the evil team. Smaug... always in a bad mood. The premise is simple: The first player plays a card, and then every other player has to play a card of the same colour. The owner of the card with the highest value wins the trick. 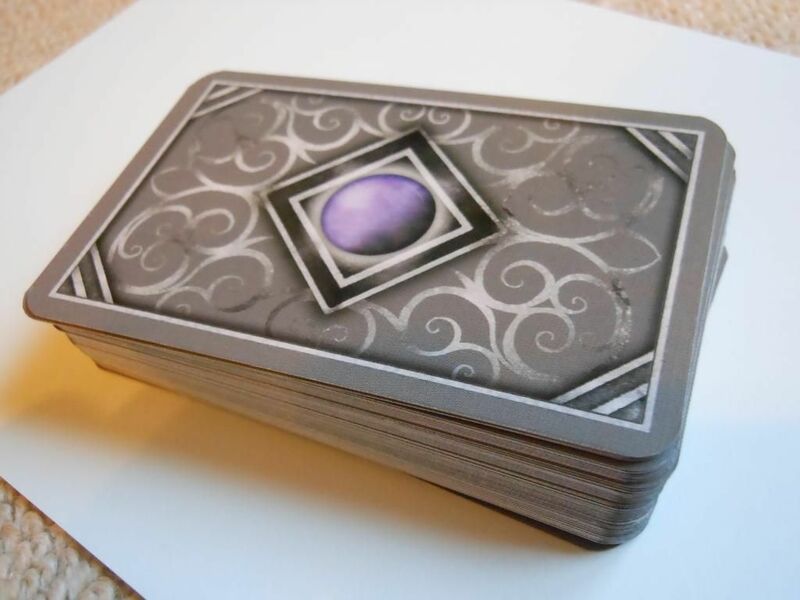 If a player cannot play a card of the correct colour, then he can play any other card from his hand and will therefore be unable to win the trick - unless the card he played is purple, as purple is the trump colour. Once everyone has played one card, the winner of the trick gets to assign cards. This is the clever twist I mentioned before. While some cards are blank, other cards also feature a symbol: There is an orc helmet, a star, and a pipe. Assigning orc helmets wounds a good player, but heals one wound on an evil player; assigning a star wounds an evil player, but heals one wound on a good player; assigning a pipe means that player will be dealt one extra card in the next round (he must then discard down to the correct number of cards, allowing him to tailor his deck to his play style). Bard is about to ruin Smaug's day. What makes the assigning system even cleverer is that each character assigns cards in a different way. 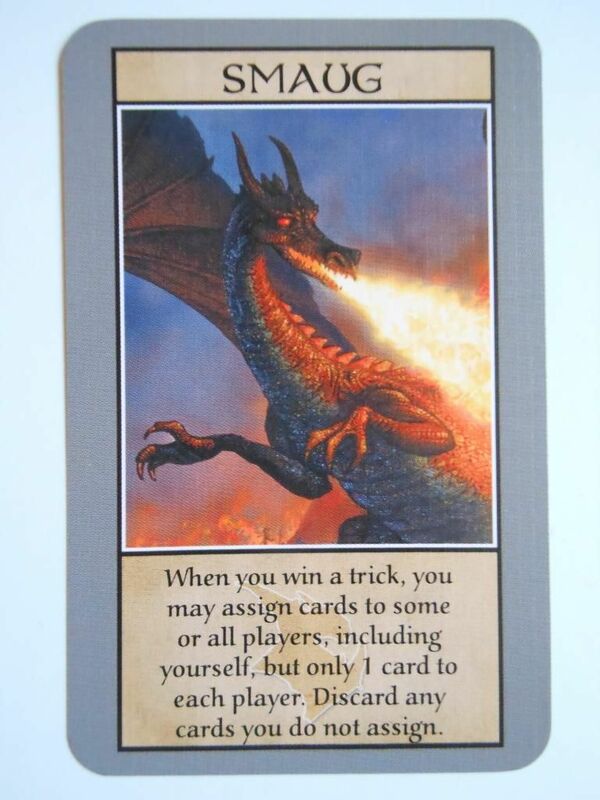 For example, Smaug can choose to assign up to one card to each player, while Thorin is reckless and has to randomly allocate a card to each player (meaning he can hurt his team-mates or help his opponents). This really does lift the game and gives you something to think about above and beyond the rather simple choice of what card you are going to play. For example, the good team will usually be trying to get Gandalf to win, as he has the strongest power for assigning cards. It is great fun trying to remember what has already been played, and trying to determine what card to play to make sure Gandalf can beat or trump it without Thorin or Bilbo being forced to play a better card. Sometimes it might even be better for a team to "throw" the trick by purposefully playing to lose. Of course, if you know your team is going to lose a trick, then you need to carefully select cards to play that will not benefit your opponent when they get assigned (either cards that feature symbols that will help you, or cards that are blank). Once all the cards have been played, any characters that have two wounds are eliminated. This may result in a win condition for one side or the other. If there is no victor, the survivors play a second round, after which the victor will be confirmed. It's a very simple game, very quick to play, very quick to learn, and a lot of fun. The theme is almost entirely irrelevant, but that doesn't matter. This isn't the sort of game I want to play every day, but it is great for small family gatherings, and a good warm-up game before something a bit more substantial hits the table. I think it is probably best with five players, as then the evil players get to work as a team as well; but with four or three it is still an entertaining way to spend half an hour. I was really impressed, and for the price, I think it is a bargain that anyone with an interest in card games should check out.